The Association poured 4,000 cubic feet of concrete in its first major roadway reconstruction project in the communities 34 year history. 6% of the 64,000 square foot road surface has been replaced. 11 of 16 worst problem areas and a storm water flume were repaired. All repairs were made with 6 inches or more of concrete and with 12 foot stress joints. 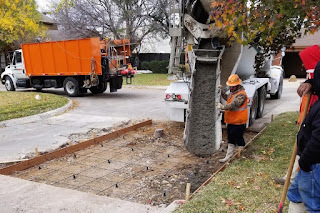 The cement used was a "high early" mixture with a 5,000 pound PSI - a much stronger pour. Beverly Oaks has 190 panels of concrete roadway and 49 of them are in various stages of deterioration (25%). This first repair project will be the first in a series. In the natural aging of the community, concrete repair will be on ongoing process as these 49 panels continue to deteriorate and other start the deterioration process.